It’s nothing new for movie and TV shows to start trends, but when a cook show becomes a trendsetter, that’s not too common. But such was the impact of the 1st season of BABA’S cu~bits, that not were restaurants serving up their versions of the cu~bits trend introduced in the show, and culinary students referring to cu~bits as the concept for their dishes….but food enthusiasts, bloggers and most importantly, housewives we serving up cu~bits too! While the show did promise introduce a new culinary trend locally that favored our local love for variety and rich flavourfull tastes, taking into account the time conconstrains our daily life….. the expectation was that it would take some time for the trend to reach the menus at homes. It’s contemporary format, shareable portions and fusion menu….along with its “focus on the food” principle, was expected to stand apart from the host of “Reality” and personality driven cookshows that currently make up the genre. “We expected audiences to sit up and say….hey, that’s a bit different!”, said Claudian Navin Stanislaus, BABA’S Head of Advertising & Promotions, “but it went beyond what we imagined”. Not new to doing things differently; having been among the first brands to develop it’s own Reality-TV cookshows with the phenominally successful Cabaran 1001 Rasa BABA’S series way back in 2004, and later the equally successful Akademi 1001 Rasa BABA’S series, BABA’S brave leap of faith seems to be on the money again. After 3 seasons, not only had they successful created a fan favorite Reality TV cooking series, but they had a stable of 18 chefs, both homemakers and professionals, primed for celebrity. Amongst them – Chef Kamarul! BABA’S cu~bits was 4 years in development as we wanted to do something different, having already done 2 successful series in the Reality TV genre and the clutter of that sort of content was peaking. Again going back to its fans, BABA’S learned that while their love for the “drama in the kitchen” was waning their options were limited to more of the same that predated the Reality TV shows – glorified cooking demos, that were personality driven cooking up the same dishes, in the same way, sometimes in the same location….often even by the game personality – with a different program name and sponsors. “So, cooking by the jetty was out, recycling some of old recipes was out and Reality TV was out,” said Navin, whose in-house team developed the concept based on what it’s fans and participants of previous shows had to say. The result was a fast-paced cookshow for Malaysian food lovers…..with easy-to-prepare recipes that you can actually want to cook! Spice it up with a studio kitchen, that you wish was in your home with all the best gadget from Kitchen Aid mixers to customized fridges, and edit it in a genre defying way, and what your left with it a culinary experience that was totally different. Of course, all that were just the appetizers as the main course was 78 mouth-watering fusion recipes featuring that Chef Kamarul and BABA’S felt would be an ideal starter set for this new culinary experience. And for dessert, was Chef Kamarul’s little tidbits of food styling tips ala cu~bits. 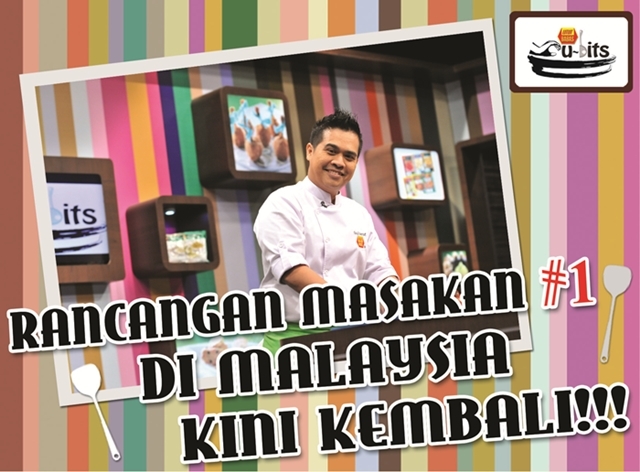 After 26 episodes which ran between July 1 and December 23, BABA’S cu~bits had not only given Malaysians a new reason for culinary experimentation, but has set a manage to stand alone as the most viewed cookshow in Malaysia last year, with an average viewership of 1mil for 26 episode….with it’s most watched episodes being watch by more than 1.2mil viewer! What do you do when you have set such a high benchmark? First of all, BABA’S cu~bits Season 2, will go on air every Sunday, 6:30pm – 7pm beginning October 6, with a repeat the next day, on Mondays from 11:30am to 12noon, this is to meet the requests from many of our fans who have ask for an earlier time and also a chance for those who missed the weekend show to catch a repeat. “This season the recipes will be inline with our objective to the take the cu~bits trend to new heights”, said Chef Kamarul during the Press Launch at 21 Table & Terrace, Bangsar Shopping Centre. “While the task of developing the recipes was challenging…..for me the most exciting part was working with my co-host and partner in life,….my wife, Yati Rahman”. Another part of this season’s campaign that will noticibly different is that there will be a special segment on TV3’s Buletin Utama every alternate Friday that will look at the spread of the cu~bits trend to popular restaurants. One such restaurant is the venue of the launch itself at 21 Tables & Terrace where invitees were treated to a taste of cu~bits from this seasons promising menu. The BABA’S brand in Malaysia is synonymous with traditional local Malay and Indian cuisine. BABA’S consumers are assured that its range of 34 products are of the highest purity and quality, do not contain any preservatives or additives, and are made from the finest ingredients from around the world. The Baba’s range of products is manufactured according to internationally recognized hygiene standards, using the latest processing methodologies and state of the art technologies. In Malaysia, a market share in access of 50% is testemant to the fact that BABA’S is the preferred choice in the country and research has shown that at least 1 of the 3 main meals eaten by Malaysian each day is made with one of the brand’s products. An achievement attained over the past decade, that was driven largely through its innovative effort in branded content productions, and other TV-centric marketing innitiatives. Today, BABA’S is steadily establishing itself as a regional and international player in the curry and spice powder category. Its range can now be found in North America, Canada, Europe, South Africa, Australia and most of Southeast Asia. 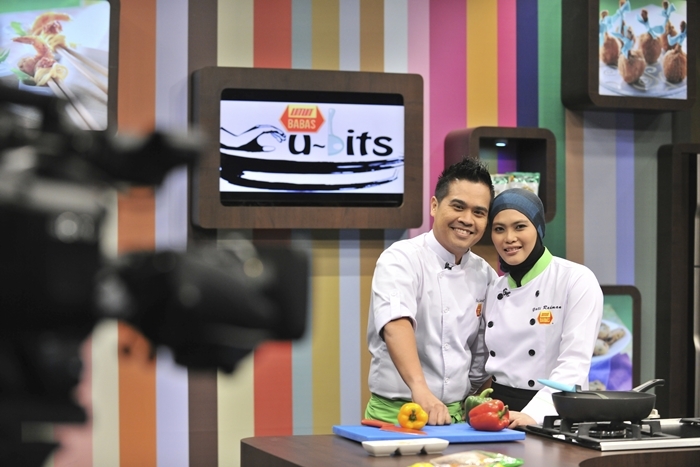 BABA’S cu~bits is a 30 minutes, fast‐paced cook show, that promises to revolutionize Malaysian dining habits. This trend-setting show is based the new innovative culinary trend known as “cu~bits” (pronounced chew~bits); a combination of the Malay word “cuba” meaning “try” and “bits” describing the serving size. Together “cu~bits” is also a play on the Malay word “cubit” which means “pinch“. Not just tapas or amoush bouche by another name, cu~bits is the trend of serving 3 complementing traditional-inspired original recipes that are ideal either as a light meal or all-day quick-fix snack….that’s best enjoyed shared with family or friends! Each episode, our chef will serve up 3 mouth‐watering morsels that are purposefully matched so that the rich flavours and aromas of various products from the BABA’S range of curry mixes, spices, ready mixes, flours and grains are perfectly blend, each complementing recipe enhancing the experience of the other. cu~bits feeds the Malaysian fetish for great food and variety…. giving you both, but without the guilty! It’s fast-paced presentation and deliver, cut to music is a 1st for local cookshows. BABA’S cu~bits is a cook show for contemporary minded food junkies, who though in love the spice-enriched asian flavours are looking for something different – but just don’t know what. The 1st season of the show last year garnered an average of 1mil viewers per episode for 26 episodes! Some episodes achieve inexcess of 1.2mil viewers and was the most watch cookshow in Malaysia last year.